Prior the launch of Cluster-I in June 1996, the Science Operations Working Group had prepared and approved a Master Science Plan for the first six months of mission operations (i.e. the first constellation, in which the spacecraft have closely-spaced orbits such that they form a approximately 600km sided tetrahedron when crossing the northern cusp). This Cluster-I Master Science Plan was edited by the EDI instrument team and issued as MPE technical note CL-MPE-TN-0009. The full text of the final issue (version 3.2) of the Cluster-I Plan is available in PDF format. Following the approval of Cluster-II in 1997, JSOC took over responsibility for editing the Master Science Plan. A revised Plan for the first six months was produced in the summer of 1998. This was prepared to allow ESOC to confirm that the Master Science Plan was consistent with various design changes in spacecraft operations between Cluster-I and Cluster-II. It also included minor changes in the Cluster orbit arising from the changed launch scenario. The changes in the Master Science Plan (to version 4.0.1) are described in a JSOC technical note (DS-JSO-TN-0030), which is available in PDF format. Further revision of the Master Science Plan (to version 5.1) was carried out in autumn 2000 after the Cluster launches. This addressed various issues identified as a result of the assessment of version 4.0.1 by the Science Operations Working Group. In particular, the ESOC assessment of version 4.0.1 indicated that the duration of burst mode data-taking could be increased by about 16%. Thus the Plan was revised to take account of this extra resource. The full text of version 5.1 of the Master Science Plan is available in PDF format. It covers a period of about four months from 2 December 2000 to 9 April 2001 (orbits 68 to 121). The Master Science Plan for the first constellation was further revised in January 2001 - to take account of final plans for the transition from commissioning into operations. This resulted in the loss of some early orbits owing to the extension of commissioning activities and the adoption of reduced operations over Christmas 2000. The new Plan was version 5.3 and covered operations from 16 January 2001 to 5 June 2001. The full text is available in PDF format. These are Bryant plots showing the location of the planned manoeuvres with respect to data-taking periods. 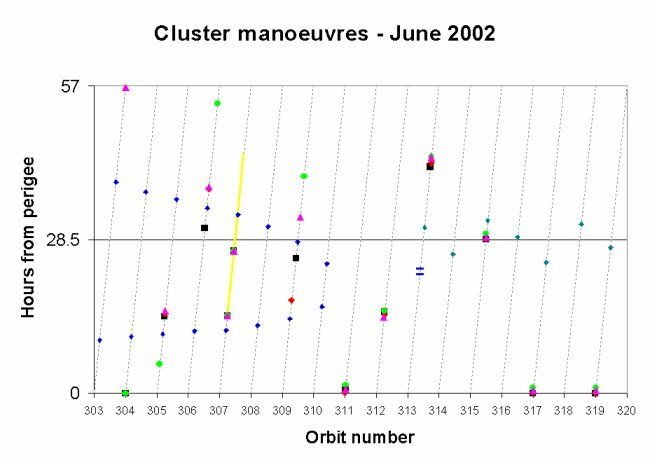 The orbit manouevres on each spacecraft are indicated by different coloured shapes following the Cluster plotting guidelines, e.g. red solid diamond for spacecraft 2 (Salsa). The period of attitude manoeuvres on 11 Jan 2002 is marked by a blue ellipse. Note that these plots are available only as bitmapped graphics and so quality is inferior to the vector graphics used in the main Bryant plots above. On 16 April 2002 there will be a 6-hour period allocated for manoeuvres to adjust the attitudes of the four Cluster spacecraft. This periods runs from 09:00 to 15:00 UTC. To show the impact of these manoeuvres on science operations, the figure below uses the Bryant plot format to show their location with respect to scientific regions and events. The manoeuvres are marked by the red line, while the blue diamonds indicate magnetopause crossings and the grey-green triangles indicate bow shock crossings. The reference spacecraft for this plot (i.e. defining perigee and boundary crossings) is spacecraft 3 (Samba). Note that the restriction of payload operations around the manoeuvres is required to allow time for configuration of the spacecraft and to protect those instruments that are sensitive to gases released during the manoeuvres. In June 2002 the Cluster separation will be increased from about 100 km up to several thousand kilometres. A summary of the manoeuvres planned to achieve this increase has been prepared by ESOC and is available in PDF format. This presents the date, time and duration of each manoeuvre on each of the four spacecraft. To show the impact of these manoeuvres on science operations, the figure below uses the Bryant plot format to show their location with respect to scientific regions and events. The manoeuvre start times are marked by black squares (spacecraft 1), red diamonds (2), green circles (3) and magenta triangles (4) - in line with the standard plotting convention for Cluster. For clarity we have not marked the manoeuvre end times as these are typically a few minutes to two hours after the start time - and thus close to the start times on the scale of this plot. The only exception to this is 30 hour period planned for slew and spin manoeuvres. This is marked by the long yellow line. The small blue diamonds show the location of magnetopause crossings and the small teal (dirty green) diamonds show the neutral sheet crossings. The two short blue bars show the location of a lunar eclipse of some of the spacecraft. The reference spacecraft for this plot (i.e. defining perigee and boundary crossings) is spacecraft 1 (Rumba). Note that we still have good opportunities to sample the skimming magnetopause on orbits 308 and 310 (only a modest increase in ram pressure above its median is needed to cause magnetopause crossings on orbit 310). We also have a good opportunity for payload operations during the short lunar eclipse on orbit 313. Tests of telemetry downlink to Maspalomas will result in science data-taking being "at risk" for some short periods (but only on one spacecraft at a time). These tests will be arranged to minimise the impact on data return. The amount of data-taking in the period 16 September to 02 October (orbits 342 to 347, PP 122 and 123) has been reduced to 105% equivalent normal mode. This provides increased margin in case of problems during the transition. The Cluster spacecraft will experience a series of long eclipses (up to 4 hours duration) in early September 2002 - near the apogees of orbits 336 to 338. In order to conserve power during these eclipses there will be no data-taking from 1 hour before the start of each eclipse until 12 hours after the end of each eclipse. This is shown in the appropriate Bryant plots. In the cases that the eclipse duration is less than 2 hours, data-taking will continue through the eclipse -- but only on those spacecraft that experience a short eclipse. This difference between operations on different spacecraft is NOT shown on the Bryant plots. Manoeuvres to maintain the attitude of the Cluster spacecraft within the required limits (with respect to the Sun) will take place between 19:00 and 23:00 on 7 October 2002 (apogee of orbit 351). In case any trim manoeuvres are required after the attitude manoeuvres, an additional manoeuvre period has been scheduled at 05:30 on 16 October 2002 (perigee of orbit 355). As many instruments have to be switched into safe modes during both manoeuvre periods, there will be no data-taking from 1 hour before each manoeuvre until 7 hours after the manoeuvre period and most of the instruments sensitive to manoeuvres will be switched on 8 hours after the manoeuvre period. These two periods are shown on the appropriate Bryant plots. Manoeuvres to maintain the attitude of the Cluster spacecraft within the required limits (with respect to the Sun) will take place between 10:00 and 18:00 on 15 January 2003 (apogee of orbit 393). Orbit trim manoeuvres are planned after the attitude manoeuvres and have been scheduled for a short period around 03:30 on 24 January 2003 (perigee of orbit 397). Manoeuvres to maintain the attitude of the Cluster spacecraft within the requ ired limits (with respect to the Sun) will take place between 07:00 and 11:30 on 25 April 20 03 (apogee of orbit 435). No orbit trim manoeuvres are currently planned after these attitude manoeuvres a s the expected drift is small and unlikely to cause a major perturbation of the tetrah edron before the next orbit manoeuvres start in early June 2003. As many instruments have to be switched into safe modes during both manoeuvre periods, there will be no data-taking from 1 hour before each manoeuvre until 7 hours after the manoeuvre period and most of the instruments sensitive to manoeuvres w ill be switched on 8 hours after the manoeuvre period. These two periods are shown on the appropriate Bryant plots. In June 2003 the Cluster separation will be decreased from about 5000 km up to about 200 km. A table of the manoeuvres planned to achieve this decrease has been provided by ESOC and made available here in PDF format. This presents the date, time and duration of each manoeuvre on each of the four spacecraft. To show the impact of these manoeuvres on science operations, the figure below uses the Bryant plot format to show their location with respect to scientific regions and events. The manoeuvre start times are marked by black squares (spacecraft 1), red diamonds (2), green circles (3) and magenta triangles (4) - in line with the standard plotting convention for Cluster. Solid symbols show manoeuvre start times while open symbols show manoeuvre end times. In many cases the manoeuvre durations are only a few minutes or seconds - and thus not distinguishable from the start times on the scale of this plot. The only exception to this is 12 hour period planned for slew and spin manoeuvres. This is marked by the long yellow line. The small blue asterisks show the location of magnetopause crossings and the small blue plus signs show the plasmasheet entry and exit. The reference spacecraft for this plot (i.e. defining perigee and boundary crossings) is spacecraft 1 (Rumba). Note that we still have good opportunities to sample the skimming magnetopause on orbits 461 to 464 (only a modest increase in ram pressure above its median is needed to cause magnetopause crossings on orbit 463). The Cluster spacecraft will experience a series of long eclipses (3 to 4 hours duration on all four spacecraft) in early September 2003 - near the apogees of orbits 491 and 492. In order to conserve power during these eclipses there will be no data-taking from 1 hour before the start of each eclipse until 12 hours after the end of each eclipse. This is shown in the appropriate Bryant plots. There are also short eclipses (less than 2 hours duration on all four spacecraft) near the apogee of orbit 490. It is expected that there will be data-taking during these eclipses, but this is subject to confirmation. As many instruments have to be switched into safe modes during manoeuvre periods, there will be no data-taking from 1 hour before each manoeuvre until 7 hours after the manoeuvre period and most of the instruments sensitive to manoeuvres will be switched on 8 hours after the manoeuvre period. These periods are shown on the appropriate Bryant plots. In May 2004 the Cluster separation will be increased from about 200 km up to 1300/1000 km. A detailed table of the planned manoeuvres has been prepared by ESOC and can be downloaded as a PDF file (new version dated 30 March). This is an update of an earlier plan dated 26 February (PDF file). The old plan has been retained here for completeness of the historical record since it was used to set up the safety windows in the Master Science Plan. The two manoeuvre plans are consistent within the safety margins used in MSP preparation. Thus the safety windows have not been changed so that priority can be given to other issues that are important for the overall scientific return. To show the impact of these manoeuvres on science operations, the figure below uses the Bryant plot format to show their location with respect to scientific regions and events. The manoeuvre start times are marked by black squares (spacecraft 1), red diamonds (2), green circles (3) and magenta triangles (4) - in line with the standard plotting convention for Cluster. Solid symbols show manoeuvre start times while open symbols show manoeuvre end times. In many cases the manoeuvre durations are only a few minutes or seconds - and thus not distinguishable from the start times on the scale of this plot. The reference spacecraft for this plot (i.e. defining perigee and boundary crossings) is spacecraft 1 (Rumba). As a general rule we avoid instrument operations from one hour before each manoeuvre until eight hours after each manoeuvre. Note that the restriction of payload operations around the manoeuvres is required to allow time for configuration of the spacecraft and to protect those instruments that are sensitive to gases released during the manoeuvres. As many instruments have to be switched into safe modes during manoeuvre periods, there will be no data-taking from 1 hour before each manoeuvre until several hours after the manoeuvre period and the instruments sensitive to manoeuvres will be switched on at least 8 hours after the manoeuvre period. These periods are shown on the appropriate Bryant plots. Manoeuvres to maintain the attitude and spin of the Cluster spacecraft within the required limits (with respect to the Sun) will take place on 5/6 October 2005 from 19:00 to 00:40 (orbit 811, before apogee). As many instruments have to be switched into safe modes during manoeuvre periods, there will be no data-taking from 1 hour before each manoeuvre until several hours after the manoeuvre period and the instruments sensitive to manoeuvres will be switched on at least 8 hours after the manoeuvre period. These periods are shown on the appropriate Bryant plots. To balance this loss of data-taking, a new BM of 1.9 hours is placed at in the northern cusp on orbit 811. 28 June, 16:39 to 19:42 (trim manoeuvre, around perigee of orbit 923) To aid long-term planning we allow a 20 minute margin on the time of the manoeuv res. 20 July, 03:30 to 04:30 (all sc) which is around perigee at start of orbit 932.
due to pressure of deadlines, no BM adjustment was made for the trim manoeuv res. The Cluster spacecraft will experience a series of umbral eclipses in mid-September 2006. There will not be enough power to operate the payloads in these periods, so they will switched off as shown in the table below. Due to the latest power constraints the SSRs will be emptied before each eclipse. Thus no burst mode adjustment will be made to balance the no-data-taking periods (as has been the practice in previous long eclipse seasons). Given the absence of burst mode balancing, the payload off periods have not been consolidated to focus on 3 or 4 spacecraft operations (as was also done in previous seasons). The payload off periods are restricted to those requested by ESOC. The only period in which all four payloads will be switched off simultaneously is 19:30 to 24:00 on 15 September. This period is shown on the appropriate Bryant plots. The other periods are not displayed on the Bryant plots (the plotting software does not have the capability to handle these periods). These all fall during orbit 969. As many instruments have to be switched into safe modes during manoeuvre periods, there will be no data-taking from 1 hour before each manoeuvre until several hours after the manoeuvre period and the instruments sensitive to manoeuvres will be switched on at least 8 hours after the manoeuvre period. This restriction is required to allow time to protect those instruments that are sensitive to gases released during the manoeuvres. Given the dispersion of manoeuvre times, each payload will put separately into its manoeuvre safe modes (i.e. there will be no coordinated payload-off periods). This means that, at any time during the manoeuvre period, there will be two, and often three, payloads operating. This approach also ensures clean operation of FGM extended mode during payload-off periods, because the off period on each spacecraft is limited to about 8 hours. As no coordinated payload-off periods are planned there will be no adjustments to BM1 periods. No trim manoeuvres are planned as phasing manoeuvres will take place during November. There will be no science data-taking for a period around each manoeuvre as many instruments have to be switched into safe modes during so they are not damaged by gases released during the manoeuvres. Given the closeness of manoeuvre times, these payload switch-offs will be coordinated into periods covering manoeuvres on all four spacecraft as shown in the table below. The no-data-taking period will be balanced by additional burst mode away from the manoeuvre period. These all fall during orbit 1005. As many instruments have to be switched into safe modes during manoeuvre periods, there will be no data-taking from 1 hour before the first manoeuvre until seven hours after the last manoeuvre. The instruments sensitive to manoeuvres will be switched on at least 8 hours after the manoeuvre period. The no-data-taking period will be balanced by additional burst mode away from the manoeuvre period (2.7 hours at the inbound bow shock on orbit 1003). Trim manoeuvres are planned to take place around 08:00 on 19 January (perigee of orbit 1009). There will be a similar no-data-taking period around these manoeuvres. This will be balanced by additional burst mode away from the manoeuvre period (1.4 hours at inbound magnetopause on orbit 1010). These all fall during orbit 1046. As many instruments have to be switched into safe modes during manoeuvre periods, there will be no data-taking from 30 minutes before the first manoeuvre until six hours after the last manoeuvre. The instruments sensitive to manoeuvres will be switched on at least 8 hours after the manoeuvre period. The no-data-taking period will be balanced by additional burst mode away from the manoeuvre period (1.5 hours at outbound magnetopause of orbit 1046). No trim manoeuvres are planned as the Cluster phasing manoeuvres will follow soon after (end of May). 04 July, 17:04 to 21:06 (trim manoeuvre, around perigee of orbit 1079) The drift manoeuvres will affect only spacecraft 1, 2 and 3 - while the trim man oeuvres will affect all four spacecraft. To reduce the risk of collision during the manoeuvres, spacecraft 3 will have two additional manoeuvres on 24 May at 04:23 and 22:19. To aid long-term planning we allow a margin on the time of each manoeuvres. T his is typically 10 minutes, but in a few cases on spacecraft 3 we allow larger marg ins: the two additional manoeuvres on 24 May have 2 hours margin, while the 25 May manoeuvre has 1 hour margin. BM1 at outbound bow shock on orbit 1062 extended from 2.5 to 4.0 hours. BM1 at outbound magnetopause on orbit 1072 extended from 2.5 to 4.0 hours. These all fall during orbit 1087. As many instruments have to be switched into safe modes during manoeuvre periods, there will be no data-taking on each spacecraft for a period around its manoeuvre time. The instruments sensitive to manoeuvres will remain in their safe modes until at least 8 hours after the manoeuvre period. The no-data-taking period will be balanced by additional burst mode away from the manoeuvre period (1 hour at the perigee of orbit 1088). As the sc1 manoeuvre is well-separated in time this has a separate no data-taking period from 05:15 to 09:30. The closely space manoeuvres on sc2, 3 and 4 will have a common no data-taking period from 11:15 to 19:25. This approach reduces the complexity of the commanding while retaining a scheduled WBD MSO operation from 09:46 to 11:39. These all fall around the perigee of orbit 1091. As many instruments have to be switched into safe modes during manoeuvre periods, there will be no data-taking on each spacecraft for a period around its manoeuvre time. The instruments sensitive to manoeuvres will remain in their safe modes until at least 8 hours after the manoeuvre period. The no-data-taking period will be balanced by additional burst mode away from the manoeuvre period (3 hours rather than 1.5 hours at the plasmasheet crossing on orbit 1091). As the manoeuvres fall naturally in two pairs, there will be two separate no-data-taking periods: (a) 07:15 to 15:55 for sc 1 and 2; and (b) 14:45 to 23:25 for sc 3 and 4. This approach reduces the complexity of the commanding while avoiding a very long no-data-taking period. The Cluster spacecraft will experience a series of umbral eclipses in mid-September 2007. There will not be enough power to operate the payloads in these periods, so they will switched off as shown in the table below. (Type NOF indicates that FGM will remain powered on and may collect low-resolution data; type ALL indicates that all instruments are powered off.) Due to the latest power constraints the SSRs will be emptied before each eclipse. Thus no burst mode adjustment will be made to balance the no-data-taking periods (as was the practice in long eclipse seasons of 2001-2005). Given the absence of burst mode balancing, the payload off periods have not been consolidated to focus on 3 or 4 spacecraft operations (as was also done in previous seasons). The payload off periods are restricted to those requested by ESOC. These periods fall on the outbound legs of orbits 1109 to 1113, except for the long off-period on spacecraft 1. This starts late on orbit 1111, spans all of orbits 1112 to 1114 and ends on the outbound leg of orbit 1115. There are no periods when all four payloads are switched off simultaneously. Thus no gaps are displayed on the Bryant plots (the plotting software does not have the capability to handle the the individual payload-off periods). These all fall during orbit 1126. The instruments sensitive to manoeuvres will remain in their safe modes until at least 8 hours after the manoeuvre period. The 4-spacecraft no-data-taking period will be balanced by additional burst mode away from the manoeuvre period (BM at the plasmasheet crossing in orbit 1126 extended from 3.5 to 3.9 hrs). Trim manoeuvres are not planned as the orbit phasing manoeuvres will follow shortly. A series of manoeuvres to adjust the separation of the Cluster spacecraft will take place between late October and mid-December 2007. The manoeuvre times and durations are shown below; a blank entry indicates where the duration time is not yet known and as it is dependent on the performance of earlier manouevres. As many instruments have to be switched into safe modes during manoeuvre periods, there will be no data-taking on each spacecraft for a period around each of its manoeuvre times. See the notes below for details. Four-spacecraft off periods are given in a separate table below. During the manoeuvres on 10 November, data-taking will continue on all four spacecraft to allow FGM and WEC measurements on all spacecraft while Rosetta is in the far tail region. In cases where three payloads are simultaneously in no data-taking modes, we stop data-taking on all spacecraft. This allows us to balance the data-taking at MSP level by adding extra burst mode as shown in the table below. These all fall during orbit 1166. As many instruments have to be switched into safe modes during manoeuvre periods, there will be no data-taking on each spacecraft from 11:45 to 23:30 on 28 January. This no-data-taking period will be balanced by additional burst mode (2.3h) at the outbound magnetopause on orbit 1168. Trim manoeuvres are planned on all four spacecraft at 15:00 on 4 February. As many instruments have to be switched into safe modes during manoeuvre periods, there will be no data-taking on each spacecraft from 14:45 to 22:00 on 4 February. This no-data-taking period will be balanced by additional burst mode (1.3h) at the inbound bow shock on orbit 1169. The instruments sensitive to manoeuvres will remain in their safe modes until at least 8 hours after the manoeuvre period. These all fall early in orbit 1203. As many instruments have to be switched into safe modes during manoeuvre periods, there will be no data-taking on each spacecraft from 08:00 to 15:00 on 25 April. This no-data-taking period will be balanced by additional burst mode (1.2h) at the apogee of orbit 1203. As many instruments have to be switched into safe modes during manoeuvre periods, there will be no data-taking on spacecraft 3 for several hours around each manoeuvre, typically from one hour before the manoeuvre to 7 hours after the manoeuvre. There will be no trim manoeuvres on the other spacecraft. A series of manoeuvres to adjust the separation and attitude of the Cluster spacecraft will take place in June to August 2008. The manoeuvre times and durations are shown below. As many instruments have to be switched into safe modes during manoeuvre periods, there will be no data-taking for several hours around each manoeuvre, typically from one hour before the manoeuvre to 7 hours after the manoeuvre. Note that we stop data-taking on all s/c even if there are manoeuvres on only three spacecraft. The Cluster spacecraft will experience a series of umbral eclipses between 19 September and 10 October 2008. There will not be enough power to operate the payloads in these periods, so they will switched off as shown in the table below. Type NOF indicates that FGM will remain powered on and may collect low-resolution data; type ALL indicates that all active instruments are powered off (note that ASPOC is no longer active and will remain switched off). There is also a short penumbral eclipse on spacecraft 2 on 17 September (08:03 to 08:51); payload operations will continue during this eclipse. EDI is an exception to this plan. The EDI instrument on each spacecraft will be powered off at the start of long eclipses for that spacecraft. It will be re-started under manual control by ESOC after the end of long eclipses on each spacecraft. See the EDI status column in the table. Due to the latest power constraints the SSRs will be emptied before each eclipse. Thus no burst mode adjustment will be made to balance the no-data-taking periods (as was the practice in long eclipse seasons of 2001-2005). Given the absence of burst mode balancing, the payload off periods have not been consolidated to focus on 3 or 4 spacecraft operations (as was also done in previous seasons). The payload off periods are restricted to those requested by ESOC. These periods fall on orbits 1265 to 1274. They typically start a few hours before perigee and end around 15 hours after perigee - as shown in the figure below. Thus the payload off periods cover the perigee region, the interior cusp crossings (close to perigee) and the plasmasheet crossings. To illustrate this, the time of the Cluster 1 neutral sheet crossings (NS) is also shown in the figure. A series of manoeuvres to adjust the separation and attitude of the Cluster spacecraft will take place in November and December 2008. The manoeuvre times and durations are shown below. As many instruments have to be switched into safe modes during manoeuvre periods, there will be no data-taking for several hours around each manoeuvre, typically from one hour before the manoeuvre to 7 hours after the manoeuvre. The instruments sensitive to manoeuvres will remain in their safe modes until at least 8 hours after the manoeuvre period. In six out of seven cases above, we have closely-spaced manoeuvres on 3 or 4 spacecraft. In these cases we stop data-taking on all four spacecraft. This is then balanced by additional burst mode at other times. See the MSP for this period. In the case of spacecraft 1 there will not be enough power to operate the payload between 15:37 and 17:35. So the active instruments will either be switched off (CIS, FGM, PEACE and WEC) or put in standby mode (EDI and RAPID) for this period. The use of standby mode avoids the risk that instrument patches have to be reloaded. In addition, the HPA shall be switched off from 15:46 to 17:27, so no WBD passes will be possible during that period. In the case of spacecraft 2, science data-taking will continue as normal for a short eclipse case. In the case of spacecraft 3, there is no eclipse, so science data-taking will continue as normal. In the case of spacecraft 4, science data-taking will continue as normal for a short eclipse case. But the HPA shall be switched off from 15:19 to 16:56, so no WBD passes will be possible during that period. A series of manoeuvres to adjust the separation and attitude of the Cluster spacecraft will take place in February 2009. The manoeuvre times and durations are shown below. As many instruments have to be switched into safe modes during manoeuvre periods, there will be no data-taking for several hours around each manoeuvre, typically from one hour before the manoeuvre to 7 hours after the manoeuvre. The instruments sensitive to manoeuvres will remain in their safe modes until at least 8 hours after the manoeuvre period. In both cases above, we have closely-spaced manoeuvres on 3 or 4 spacecraft. Thus we stop data-taking on all four spacecraft. This is then balanced by additional burst mode at other times. See the MSP for this period. The Cluster spacecraft will experience a series of short eclipses on 37 orbit s between 16 February and 12 May 2009. During some of these eclipses there will no t be enough power to operate the payloads on spacecraft 1, 3 and 4. Thus the paylo ads on these spacecraft will switched off or placed in standby. The payload on space craft 2 will operate through the eclipse season. The payload off periods for spacecraft 1, 3 and 4 are shown in the table bel ow. During these periods there will be no data-taking and four of the instruments (CIS, FGM , PEACE and WEC) will be switched off. The handling of the other two instruments (EDI and RAPID) will be more complex: (a) EDI on s/c 1 will switched off for the duration of the eclipse season, (b) R APID on s/c 1 will be switched off during each period as for the four instruments, and (c) EDI and RAPID on s/c 3 and 4 will be placed in standby mode during the nominal off period. The standby mode is used in order to preserve instrument patches. A series of manoeuvres to bring the Cluster-3 spacecraft closer to its sister spacecraft will take place in April and May 2009. The manoeuvre times are shown below. As many instruments have to be switched into safe modes during manoeuvre periods, there will be no data-taking for several hours around each manoeuvre, typically from one hour before the manoeuvre to 7 hours after the manoeuvre. The instruments sensitive to manoeuvres will remain in their safe modes until at least 8 hours after the manoeuvre period. Eclipse constraints require payload switch-off at 16:27. For simplicity of implementation, the manoeuvre protection is achieved by advancing payload switch-off to 14:30 (one hour before the manoeuvre). This manoeuvre was originally planned for 16 April, but was advanced to avoid any possible overlap with the Herschel-Planck launch. Eclipse constraints require payload switch-off at 09:00. For simplicity of implementation, the manoeuvre protection is achieved by advancing payload switch-off to 08:15 (one hour before the manoeuvre). No data-taking on C3 from 20:34 to 04:36. No data-taking on C3 from 05:47 to 13:47. In all cases above, we have manoeuvres on a single spacecraft. Thus we continue data-taking on the other spacecraft, subject to their own eclipse constraints, and do not balance the lost data-taking by additional burst mode at other times. To minimise impact on plans for WBD operations, we will stop data-taking in a phased manner: at 10:40 on C1, at 11:40 on C2, at 12:40 on C3 and at 13:40 on C4. Data-taking will resume simultaneously on all spacecraft at 18:00. This gives a common-off period from 13:40 to 18:00; this is balanced by extending the magnetopause BM1 period on 10 May. No data-taking on all spacecraft from 01:50 to 07:00. The early restart reduces impact on plans for WBD operations. This common off-period is balanced by extending the magnetopause BM1 period on 17 May. A series of manoeuvres to adjust the constellation will take place in July and August 2009. The manoeuvre times are shown below. As many instruments have to be switched into safe modes during manoeuvre periods, there will be no data-taking for several hours around each manoeuvre, typically from one hour before the manoeuvre to 7 hours after the manoeuvre. The no-data-taking period will sometimes end earlier in order to preserve WBD operations already scheduled. The instruments sensitive to manoeuvres will remain in their safe modes until at least 8 hours after the manoeuvre period. No data-taking on all four spacecraft from 19:16 to 03:39. This is balanced by additional BM1 as shown in the Master Science Plan above. 23 July, 06:03 (sc 4) - trim? No data-taking on all four spacecraft from 03:09 to 13:03. This is balanced by additional BM1 as shown in the Master Science Plan above. No data-taking on all four spacecraft from 06:30 to 10:00. This is balanced by additional BM1 as shown in the Master Science Plan above. No data-taking on all four spacecraft from 09:54 to 13:51. This is balanced by additional BM1 as shown in the Master Science Plan above. No data-taking on all four spacecraft from 13:13 to 20:51. This is balanced by additional BM1 as shown in the Master Science Plan above. A series of manoeuvres to adjust the attitude of the Cluster spacecraft will take place in August and September 2009. The manoeuvre times and durations are shown below. As many instruments have to be switched into safe modes during manoeuvre periods, there will be no data-taking for several hours around each manoeuvre, typically from one hour before the manoeuvre to 7 hours after the manoeuvre. The instruments sensitive to manoeuvres will remain in their safe modes until at least 8 hours after the manoeuvre period. No data-taking on all spacecraft from 05:15 to 15:00. No data-taking on all spacecraft from 23:15 (3 Sep) to 08:55. These two no data-taking periods are balanced by additional burst mode at other times. See the MSP for this period. The Cluster spacecraft will experience a series of eclipses on 22 orbits between 28 September and 17 November 2009. During some of these eclipses there will not be enough power to operate the payloads on some or all of the spacecraft. Thus the payloads on the affected spacecraft will switched off as shown in the table below. Adjust the attitudes of the spacecraft to keep these within operational limits with respect to the Sun. Lower the apogee to ensure that data can be downlinked throughout the orbit. This lowering, with no increase in peri gee height, will reduce the Cluster orbit period from 57.2 hours to 54.3 hours. Adjust the spacecraft separation to address forthcoming science targets. The manoeuvre times are shown below. As many instruments have to be switched into safe modes during manoeuvre periods, there will be no data-taking for several hours around each manoeuvre, typically from one hour before the manoeuvre to 7 hours after the manoeuvre. The no-data-taking period will sometimes end earlier in order to preserve WBD operations already scheduled. The instruments sensitive to manoeuvres will remain in their safe modes until at least 8 hours after the manoeuvre period. No data-taking on all four spacecraft from 14:00 to 00:00. This is balanced by additional BM1 as shown in the Master Science Plan above. No data-taking on all four spacecraft from 12:23 to 20:55. This is balanced by additional BM1 as shown in the Master Science Plan above. No data-taking on spacecraft 4 from 06:36 to 15:02. There is no BM1 balancing as only one spacecraft has no data-taking. No data-taking on all four spacecraft from 13:03 to 21:05. This is balanced by additional BM1 as shown in the Master Science Plan above. No data-taking on all four spacecraft from 01:56 to 10:01. This is balanced by additional BM1 as shown in the Master Science Plan above. No data-taking on all four spacecraft from 14:31 to 22:37. This is balanced by additional BM1 as shown in the Master Science Plan above. No data-taking on all four spacecraft from 05:35 to 14:36. This is balanced by additional BM1 as shown in the Master Science Plan above. In January 2010, there will be a series of manoeuvres to adjust the attitudes of the spacecraft to keep these within operational limits with respect to the Sun. The manoeuvre times are shown below. No data-taking on all four spacecraft from 14:00 to 00:15 (14 Jan). This is balanced by additional BM1 as shown in the Master Science Plan above. No data-taking on all four spacecraft from 12:31 to 21:31. This is balanced by additional BM1 as shown in the Master Science Plan above. As many instruments have to be switched into safe modes during manoeuvre periods, there will be no data-taking for several hours around each manoeuvre, typically from one hour before the manoeuvre to 7 hours after the manoeuvre. The instruments sensitive to manoeuvres will remain in their safe modes until at least 8 hours after the manoeuvre period. In April 2010, there will be a series of manoeuvres to adjust the attitudes of the spacecraft to keep these within operational limits with respect to the Sun. The manoeuvre times are shown below. The no data-taking periods around the eclipse on 08 April will be extended back in time to encompass these manoeuvres, i.e. from 14:30 to 06:30 on C3, from 14:30 to 07:30 on C1 and from 18:07 to 07:30 on C2 and C4. This substantial extension is balanced by additional BM1 as shown in the Master Science Plan above. The no data-taking periods around the eclipse on 15 April will be extended back in time to encompass these manoeuvres, i.e. from 10:30 to 10:00 on C1 and C3 and from 12:56 to 10:00 on C2 and C4. This is only a small loss, so no additional BM1 has been added. The Cluster spacecraft will experience a series of umbral eclipses between 15 January and 22 June 2010. There will not be enough power to operate the payloads in these periods, so they will switched off as shown in the table below. These are cases where there is sufficient battery capacity to avoid switch-off and where remaining on avoids problems such as loss of software patches and calibration issues. 2. Due to power constraints the SSRs will be emptied before each eclipse. Thus no burst mode adjustment will be made to balance the no-data-taking periods (as was the practice in earlier eclipse seasons). Given the absence of burst mode balancing, the payload off periods have not been consolidated to focus on multi-spacecraft operations (as was also done in previous seasons). The payload off periods are restricted to those requested by ESOC. 3. These payload-off periods are not are displayed on the Bryant plots as the plotting software does not have the capability to handle individual payload-off periods for each spacecraft. 4. The spacecraft 3 payload-off period on 19 January nominally runs from 13:30 to 19:00 (ESOC request). It has been extended here to match the safety periods around the trim manoeuvre which occurs at the same time (see above). 5. The spacecraft payload-off periods on 08 April nominally start at 14:30 (C1 and C3) and 18:07 (C2 and C4) (ESOC request). These have been extended earlier to 06:30 (C3) and 07:30 (C1, C2 and C4) to provide safety periods around the attitude manoeuvres which occur just before the eclipses (see below). 6. The spacecraft payload-off periods on 15 April nominally start at 10:30 (C1 and C3) and 12:56 (C2 and C4) (ESOC request). These have been extended earlier to 10:00 to provide safety periods around the trim manoeuvres which occur just before the eclipses (see below). 7. The spacecraft 4 payload-off period on 17 April nominally runs from 19:11 to 20:05 (original ESOC request). It has been extended to run from 18:00 to 03:00 next day at the further request of ESOC (to reflect updated power constraints). EDI, FGM and RAPID on C4 will be switched off during this period. On 1 June 2010, there will be a manoeuvre to adjust the drift of Cluster 3. The manoeuvre time is shown below. This manoeuvre falls in the payload off period around an eclipse on Cluster 3. Payload off runs from 22:00 on 1 June to 07:00 on 2 June. No further reduction in data-taking is needed. In July 2010, there will be a series of manoeuvres to adjust the attitudes of the spacecraft to keep these within operational limits with respect to the Sun. The manoeuvre times are shown below. The no data-taking periods around these manoeuvres from 16:00 to 20:09. This gap is balanced by additional BM1 as shown in the Master Science Plan above. The instruments sensitive to manoeuvres will remain in their safe modes until at least 8 hours after the manoeuvre burns. The early start of data-taking supports a pre-planned WBD operation. There will be no trim manoeuvres as orbit manoeuvres follow soon after these attitude manoeuvres. A series of manoeuvres of the Cluster spacecraft will take place during July, August and September 2010. These will adjust the spacecraft separation to address forthcoming science targets. No data-taking on spacecraft 2 from 19:50 to 03:29. This is not balanced by additional BM1 as it applies on only one spacecraft. Spacecraft 1, 3 and 4 continue data taking in line with the Master Science Plan. No data-taking on all four spacecraft from 18:30 to 19:54. This gap is balanced by additional BM1 as shown in the Master Science Plan above. No data-taking on all four spacecraft from 19:30 to 03:40. This gap is balanced by additional BM1 as shown in the Master Science Plan above. No data-taking on spacecraft 2 from 15:25 to 23:25. This is not balanced by additional BM1 as it applies on only one spacecraft. Spacecraft 1, 3 and 4 continue data taking in line with the Master Science Plan. No data-taking on spacecraft 2 from 10:25 to 17:56. This is not balanced by additional BM1 as it applies on only one spacecraft. Spacecraft 1, 3 and 4 continue data taking in line with the Master Science Plan. No data-taking on spacecraft 2 from 04:11 to 11:42. This is not balanced by additional BM1 as it applies on only one spacecraft. Spacecraft 1, 3 and 4 continue data taking in line with the Master Science Plan. No data-taking on all four spacecraft from 17:21 to 02:20. This gap is balanced by additional BM1 as shown in the Master Science Plan above. No data-taking on all four spacecraft from 05:55 to 09:03. This gap is balanced by additional BM1 as shown in the Master Science Plan above. In October 2010, there will be a series of manoeuvres to adjust the attitudes of the spacecraft to keep these within operational limits with respect to the Sun. The manoeuvre times are shown below. No data-taking on all four spacecraft from 10:00 to 19:30. These will be followed by trim manoeuvres as follows. No data-taking on all four spacecraft from 11:27 to 16:30. These no data-taking periods are balanced by additional BM1 as shown in the Master Science Plan above. The instruments sensitive to manoeuvres will remain in their safe modes until at least 8 hours after the manoeuvre burns. The early start of data-taking after the trim manoeuvres supports a pre-planned WBD operation. In December 2010, there will be manoeuvres on spacecraft 1, 3 and 4 to correct for the orbit drift caused by thruster gas releases arising from the spacecraft power down at eclipses. The manoeuvre times are shown below. There will be no changes to data-taking periods as these manoeuvres fall in the payload-off periods around eclipses. The instruments sensitive to manoeuvres will remain in their safe modes until at least 8 hours after the manoeuvre burns. In January 2011, there will be a series of manoeuvres to adjust the attitudes of the spacecraft to keep these within operational limits with respect to the Sun. The manoeuvre times are shown below. No data-taking on all four spacecraft from 15:30 to 01:46, which spans apogee. This no-data-taking will be balanced by extending the BM1 period that has been scheduled during the outbound crossing of the magnetosheath on the same orbit. See the MSP details for orbit 1632. There will no changes to data-taking periods on C1, C3 and C4 as these manoeuvres fall well inside the eclipse payload-off periods for these spacecraft. For C2, the manoeuvre falls 38 minutes before the nominal start of the eclipse payload-off period; so that period has been extended to run from 09:30 to 16:30 to provide manoeuvre protection (see above). The instruments sensitive to manoeuvres will remain in their safe modes until at least 8 hours after the manoeuvre burns. The Cluster spacecraft will experience a series of umbral eclipses between 22 October 2010 and 23 July 2011. There will not be enough power to operate the payloads in these periods, so they will switched off as shown in the table below. The present table covers the full eclipse season from 22 October 2010 to 23 July 2011. 1. Due to power constraints the SSRs will be emptied before each eclipse. Thus no burst mode adjustment will be made to balance the no-data-taking periods (as was the practice in earlier eclipse seasons). Given the absence of burst mode balancing, the payload off periods have not been consolidated to focus on multi-spacecraft operations (as was also done in previous seasons). The payload off periods are restricted to those requested by ESOC. 2. These payload-off periods are not are displayed on the Bryant plots as the plotting software does not have the capability to handle individual payload-off periods for each spacecraft. 3. The first payload-off period (spacecraft 2 on 22 October) has been integrated into the no-data-taking period for trim manoeuvres as specified above. 4. EDI on spacecraft 2 will be switched off continuously from 12:00 on 22 October to 21:30 on 6 December 2010 because of the difficulty of restoring patches after power-down. 5. RAPID and EDI on spacecraft 2 will remain in standby mode during eclipses from 8 December 2010. At this time there will sufficient power to maintain standby and thus preserve patches on this instruments. 6. Payload off periods on spacecraft 3 and 4 on 20 December 2010 were extended by 2h10m compared to original planning released in Sep 2010. 7. Orbit trim manoeuvres will take place during these payload-off periods, see below. 8. The payload off period on C2 on 25 January has been extended to run from 09:30 to 16:30 to provide manoeuvre protection. The original off period was 11:08 to 11:49. 9. The C1, C3 and C4 payload off periods on 18/19 April will now start 4.5 hours earlier than originally planned. This releases data downlink capacity that ESOC need to downlink the BM1 period at the tetrahedron quality parameter maximum just before the inbound bow shock. 10. The C1, C3 and C4 payload off periods on 29 March will now start later than originally planned. This gives more scope for Guest Investigator observations agreed by SOWG. 11. The C1 and C3 payload off periods on 3 April will now start later than originally planned. This gives more scope for Guest Investigator observations agreed by SOWG. 12. The payoff periods on 21 April will start about one hour earlier than originally planned on all 4 spacecraft - to provide manoeuvre protection. 13. The C2 payoff period on 25 May will start 30 mins earlier than originally planned - to provide manoeuvre protection. In April 2011, there will be a series of manoeuvres to adjust the attitudes of the spacecraft to keep these within operational limits with respect to the Sun. The manoeuvre times are shown below. These times fall at or close to the start of the eclipse payload-off periods for these spacecraft, so to provide manoeuvre protection the nominal start of the eclipse payload-off period has been brought forward to start one hour before the manoeuvre. These times fall well inside the eclipse payload-off periods for these spacecraft, so no adjustments are required. In May 2011, there will be a trim manoeuvre on Clsuter 2 to adjust for orbit drag. The manoeuvre times are shown below. This time falls close to the start of the eclipse payload-off period for this spacecraft, so to provide manoeuvre protection the nominal start of the eclipse payload-off period has been brought forward to start 30 minutes before the manoeuvre. The instruments sensitive to manoeuvres will remain in their safe modes until at least 8 hours after the manoeuvre burn. In July, August and September 2011, there will be a series of manoeuvres to adjust the orbits of the spacecraft and also to keep their attitudes within operational limits with respect to the Sun. The manoeuvre times and the surrounding no-data-taking periods are shown in the table below. In general, we stop data-taking from 1 hour before each manoeuvre until 7 hours after each manoeuvre. But this may be reduced to retain existing WBD operations if these are not overlapping or very close to the manoeuvre burns. However, the instruments sensitive to manoeuvres will remain in their safe modes until at least 8 hours after the manoeuvre burns. 1. The no-data-taking period on C2 on 25 July starts only 12 minutes before the manoeuvre. This allows us to retain a high-priority BM2 period planned to end at 0810. 2. There are two manoeuvres on C3 on 25 July. These are consolidated into a single no-data-taking period. 3. The no-data-taking periods on C1, C2 and C4 on 26 August start only 33, 39 and 26 minutes respectively before the manoeuvre burn for their spacecraft. This allows us to retain a high-priority BM2 period planned to end at 0035. 4. The manoeuvres on all four spacecraft on 1 September are very close in time, so the no-data-taking periods have been consolidated into a single period. This starts only 50 and 53 minutes before the manoeuvre burns on C1 and C3/C4 respectively. This allows us to retain a high priority BM1 period planned to end at 1900. In November 2011, there will be a series of manoeuvres to adjust the attitudes of the spacecraft to keep these within operational limits with respect to the Sun. The manoeuvre times are shown below. As those instruments sensitive to manoeuvres must be put in safe modes around the manoeuvres, there will be no data-taking on all four spacecraft around these two sets of manoeuvres: (a) from 07:45 to 19:15 on 11 Nov and (b) from 16:29 to 20:51 on 17 Nov. The short no-data-taking period on 17 Nov preserves a planned group of WBD operations on sc 1, 3 and 4, starting at 21:23. The instruments sensitive to manoeuvres will remain in their safe modes until at least 8 hours after the manoeuvre burns. The Cluster spacecraft will experience a series of umbral eclipses between 29 November 2011 and 10 April 2012. There will not be enough power to operate the payloads in these periods, so they will switched off as shown in the table below. 1. The switch-on of spacecraft 2 is delayed until 05:05 to avoid start up during BM1 operations. 2. Eclipse periods on 16/17 Dec and 01/02 Jan extended due to ground station constraints at Kourou. 3. Eclipse periods on 22 Jan, 26 Jan, 02 Feb, 22 Feb, 24 Feb. 29 Feb and 7 Mar extended to cover manoeuvres. In January to April 2012, there will be a series of manoeuvres to adjust the orbits of the spacecraft and also to keep their attitudes within operational limits with respect to the Sun. The manoeuvre times and the surrounding no-data-taking periods are shown in the table below. In general, we stop data-taking from 1 hour before each manoeuvre until 7 hours after each manoeuvre. But this may be reduced to retain existing WBD operations if these are not overlapping or very close to the manoeuvre burns. 1. These manoeuvres are close to, or within, existing payload-off periods for eclipses. So we have extended these periods, where needed, to cover the manoeuvre safety periods. 2. There are two close manoeuvres on 22 Jan, so they are combined into a single no-data-taking period. 3. The attitude manoeuvres on 17 February are 14 to 17 hours before the start of the eclipse payload-off periods, so we have a separate payload-off period for these manoeuvres. The Cluster 1, 3 and 4 spacecraft will experience lunar eclipses in May and June 2012. There will not be enough power to operate the payloads in these periods, so they will switched off as shown in the table below. In May 2012, there will be a series of manoeuvres to adjust the attitude s of the spacecraft to keep these within operational limits with respect to the Sun. The manoeuvre times are shown below. As those instruments sensitive to manoeuvres must be put in safe modes around the manoeuvres, there will be no data-taking on all four spacecraft around these manoeuvres from 07:25 to 16:36 on 22 May. As those instruments sensitive to manoeuvres must be put in safe modes around the manoeuvres, there will be no data-taking on all four spacecraft around these manoeuvres from 10:06 to 12:07 on 1 June. This period is short in order to preserve existing WBD operations around the perigee of orbit 1853. The no-data-taking periods on 28 June will end earlier than normal in order to preserve existing WBD operations. The instruments sensitive to manoeuvres will remain in their safe modes until at least 8 hours after the manoeuvre burns. The Cluster spacecraft will experience a series of umbral eclipses between 16 July and 10 August 2012. There will not be enough power to operate the payloads in these periods, so they will switched off as shown in the table below. Note that, for these eclipses, there will be a single long payload-off period on each spacecraft. The Bryant plots show the payload-off period that is common to all four spacecraft, namely 20/07/2012 23:38 to 08/08/2012 16:30. There will be manoeuvres in August and September, times shown below with adjustments (where necessary) to preserve existing WBD operations. As those instruments sensitive to manoeuvres must be put in safe modes around the manoeuvres, and the instruments sensitive to manoeuvres will remain in their safe modes until at least 8 hours after the manoeuvre burns. The Cluster 1 and 2 spacecraft will experience lunar eclipses in October and September 2012 respectively. There will not be enough power to operate the payloads in these periods, so they will switched off as shown in the table below. There will be manoeuvres in November, times shown below will be adjusted (where necessary) to preserve existing WBD operations. There will be manoeuvres in December, times shown below will be adjusted (where necessary) to preserve existing WBD operations. There will be manoeuvres in January, February, March, times shown below will be adjusted (where necessary) to preserve existing WBD operations. The Cluster spacecraft will experience a series of eclipses in January, February and March 2013. There will not be enough power to operate the payloads in these periods, so they will switched off as shown in the table below. Due to the latest power constraints the SSRs will be emptied before each eclipse. There is some risk of losing the last few hours of science data before the eclipse. To allow the Guest Investigator observations, large Burst Mode operations before the eclipses were agreed in advance with ESOC. These data will have priority over normal data. Some WBD passes, during the last 12 hours before eclipse, could need to be cancelled, in case they conflict with the extra passes needed to empty the SSR before the eclipse.